ISO 50001 is based on the ISO management system model familiar to more than a million organisations worldwide who implement standards such as ISO 9001 (quality management), ISO 14001 (environmental management), ISO 22000 (food safety), ISO/IEC 27001 (information security). 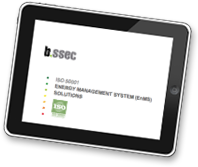 ISO 50001 enables organisations in all sectors to use energy more efficiently and reduce costs, through the development of energy management systems (EnMS). BSSEC can help you with all aspects of accreditation. We can research and prepare all the required documentation, including working with your accreditor to achieve certification. If you don’t have an accreditor we can recommend one. In short, whatever you need to achieve ISO 50001, we can help. BSSEC can undertake a no obligation desktop gap analysis to help you determine the likely workload and timescale for implementing an EnMS that will achieve ISO 50001 certification. For further information on how we would work to achieve your certification, please reference our PDF presentation (top right of this page) or contact us.